I'm definitely still holding onto (and embracing!) summer produce, as we usually have heatwave in October! I love peanut-y noodles. This looks like a great dish. This looks great. I've made something similar in the past but your recipe has more veggies. Yum. Yum, loove peanut noodles. Love all the veggies too. A definite winner! We substituted Sunbutter and made this more like a stir fry. Thanks for the great recipe! So all the veggies are raw? Then the cooked noodles make it warm? Or do most people like it cold? Kayla, yes the veggies are all raw - they weren't cold since I chopped everything before I got started and they were room temperature, but since the noodles were hot, the whole dish was warm. I also ate some leftovers chilled, and it was great that way as well. Hope all that makes sense! Dac, I'm so glad you liked it! I wish I had a Penzy's near me that I could go browse. They always have the best stuff! These were absolutely delicious. 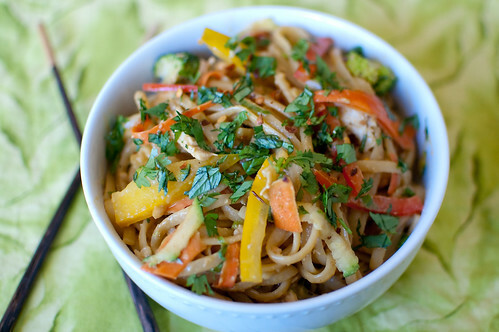 I liked the addition of extra veggies- super healthy :) I'll definitely be making them again. Thanks!! Finally made this tonight and it is great!